A 20-year-old male presented with features of right heart failure. There was no cyanosis or clubbing. He was a known case of chronic kidney disease on regular hemodialysis. The height of jugular venous pulse pressure in sitting position was 9 cm with prominent “a” and blunt Y descent. X-ray of chest and abdomen was consistent with situs inversus levocardia (SIL). A detailed sequential segmental analysis was done using two-dimensional echocardiograghy. The presence of significant pericardial effusion supported better echo windows. In the subxiphoid view, the inversion of abdominal viscera was confirmed [Figure 1]. 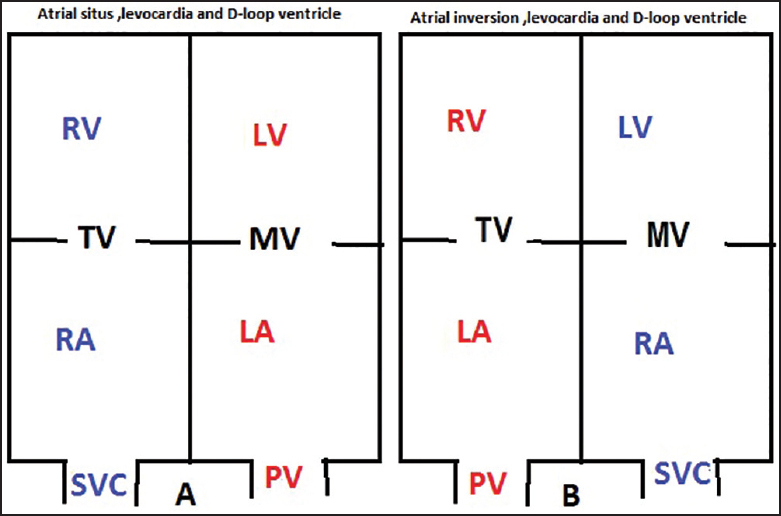 Transthoracic echo in apical 4-chamber view [Figure 2]a and [Video 1] demonstrated levocardia, D-loop ventricle, atrial inversion and SIL with D-transposition great arteries [Figure 2]b and [Video 2]. There were large remote ventricular septal defect (VSD) and a large secundum atrial septal defect. Right ventricular systolic pressure was 124 mmHg which was his right arm systolic blood pressure in the sitting position. 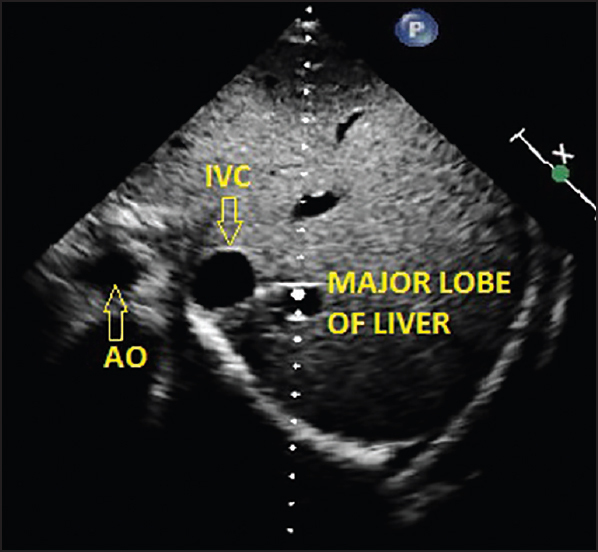 Tricuspid annular plane systolic excursion was of 0.9 cm. Aortic arch was on the left side. A complete echo diagnosis was complex congenital heart disease, SIL, D-loop ventricle (isolated levocardia), D-transposition of great arteries (DTGA), both atrial and ventricular septal defects (VSDs), increasing pulmonary blood flow situation, significant right heart (systemic ventricle) failure, moderated pericardial but without evidence of thrombus or vegetation. This is the second case vignette, wherein a complete diagnosis of isolated levocardia with DTGA has been documented only by echocardiographic sequential segmental analysis., [Figure 3]a and [Figure 3]b shows in sketches of normal four-chamber view and a four chamber view of isolated levocardia using transthoracicecho forcomparison. Chang HY, Yin WH, Hsiung MC, Young MS. A heart reversed triply: Situs inversus totalis with congenitally corrected transposition of the great arteries in a middle-aged woman. Echocardiography 2009;26:617-21.